acquistare Levitra online Muller Property Group has been making headlines recently after revealing some disturbing facts about Cheshire East Council’s interpretation of its own housing figures. comments viagra wiki drug The local authority put out a press release claiming credit for granting permission for more than 20,441 new homes, and stating that housing completions have ‘risen year on year’. 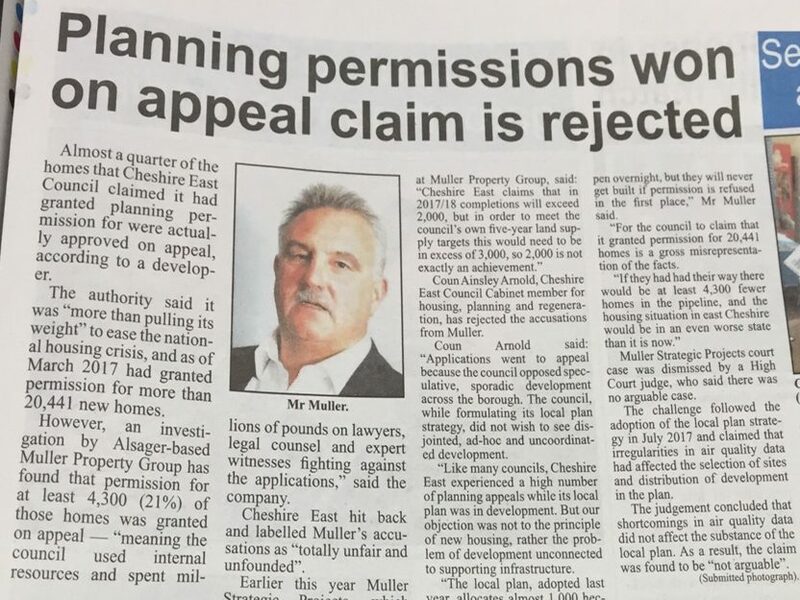 source url However, an investigation by Muller revealed that of the 20,441 homes given the green light, at least 4,300 were actually granted on appeal – meaning that the Council spent millions fighting against them. follow link It was also shown that, despite the rise in housing completions – from 614 in 2012/13 to 1,763 in 2016/17 – they are still far short of the Council’s own ‘Objectively Assessed Need’ (OAN) targets of 1,800 per year. viagra no online prescription In the past eight years the Council has racked up a deficit of 5,365 homes against the OAN target, and according to its own Housing Monitor Update report this is due to ‘persistent under delivery of dwellings’. canadian viagra 50mg Cheshire East has promised that in 2017/18 completions will exceed 2,000; but in order to meet its five year land supply targets this would need to be in excess of 3,000.
cheap viagra on internet The story has been picked up by media outlets across the North West, including BDaily, Place North West, the Crewe Chronicle, Nantwich News and the Macclesfield Express. purchase soft viagra The Council released a statement claiming that applications went to appeal because it ‘opposed speculative, sporadic development’ – but did not address the fact that the applications were subsequently granted, and were therefore deemed suitable and sustainable. quinine drug contraindications with viagra Nor did it address the fact that it had claimed credit for granting applications it in fact refused. low cost canadian viagra Our chief executive Colin Muller said: “Cheshire East put out a press release claiming it is ‘more than pulling its weight’ to ease the national housing crisis, when in fact it is doing nothing of the sort.